The Large White is a breed of domestic pig originating in Yorkshire. They are one of the most common pig breeds. Large Whites in the US are referred to as American Yorkshires, or just Yorkshires. As one would expect Large Whites are large and white. They have erect ears and a dished face. 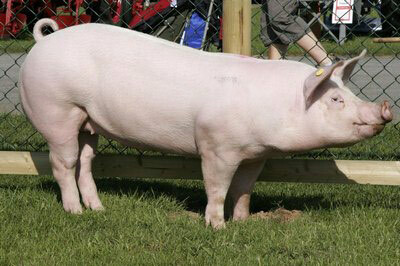 They were originally developed as an outdoor breed, but today they are favored by commercial pig breeders. First recognized in 1868, the Large White was one of the original founder breeds of the National Pig Breeders' Association (now known as the British Pig Association) and the first herdbook was published in 1884. The early history of the breed in Yorkshire is difficult to trace. The huge, coarse-boned and leggy white pigs of the region were crossed with other breeds. Before the end of the 19th Century, British Large Whites had already establishing themselves all over the world. Innovative pedigree breeders were exporting breeding stock as far as Australia, Argentina, Canada and Russia as well as most countries in Europe. The Large White has proved itself as a rugged and hardy breed that can withstand variations in climate and other environmental factors. Their ability to cross with and improve other breeds has given them a leading role in commercial pig production systems and breeding pyramids around the world. In the early 1970s the development of modern performance testing programs led to an increase in world-wide demand for Large White breeding stock from the United Kingdom. From 1970 to 1973 more than 8,500 pedigree Large Whites were exported to all parts of the world. In the early 1990s, the switch in the USA from payment on live weight to payment on lean meat percentage led to another great wave of exports of Large White genetics from Britain.